It looks great! Don't forget to tell your friends on Twitter and Facebook! 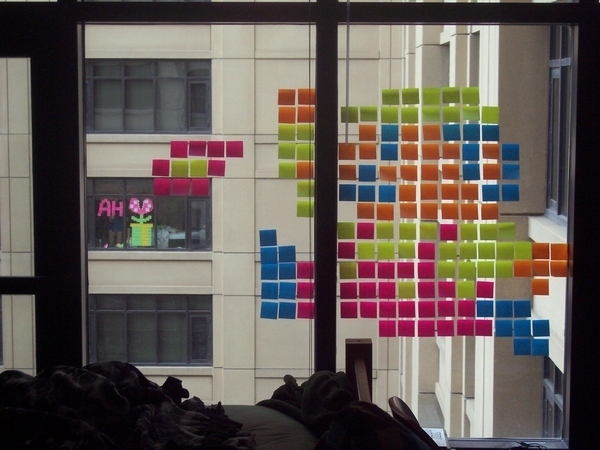 Yesterday, after Reddit user lukeco adorned his Columbia College dorm room window with a Post-It note Mario, his neighbor across the courtyard responded by creating a Post-It note Piranha Plant: After that, lukeco upped the ante by giving his Post-It Mario a fire flower upgrade, shooting a fireball across the courtyard at his new nemesis: As it turns, lukeco’s nemesis is also a Reddit user named emilyfree who posted pictures from her own perspective: Naturally, the Internet insisted that they meet and fall in love, so he spelled out his room number in Post-It notes, and she paid him a visit: No word from lukeco or emilyfree yet about what happened next, but presumably their wedding ceremony will be next spring some time. I'm hoping to get an invite. If the Mountain Goats Scored Super Mario The video (and song) are taken from the perspective of the extremely relatable Toad, whose sole purpose in the game is to wait for Mario in order to guide him to the next castle. Dr. Mario Quilt Just finished my Dr. Mario quilt! 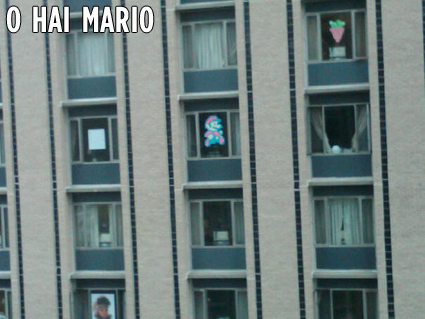 Mario Recreated In Petri Dish In the name of science and awesome, researchers from the University of Osaka in Japan created this Mario in a petri dish by genetically engineering bacteria to express fluorescent proteins and carotenoid pigments. It looks like you've been disconnected from Facebook. Click the Facebook Connect button to reconnect. Is it me or is she in her underwear in the second one? He did not even make his bed up for her to come over…Or, er wait…Oh la la! The internet demands the arranged marriage of these two! She's already sporting some ring bling. Please validate your account to contribute content. Sorry, it looks like you got signed out somehow. Please sign in again. First & Last Name Your name will appear along side your contributions and on your profile page. Email Address We’ll send a conformation email to this address. It won’t appear publicly. You need a BuzzFeed account to contribute. Create one or sign in. Already have a BuzzFeed account? Thanks for participating. View Your Response or Add Another? This is so scary and amazing. Copyright © 2011 BuzzFeed, Inc.
BuzzFeed is currently working with select partners to help them track what’s going viral on their sites using the same advanced viral tracking and analytics tools used on BuzzFeed.com. If you’re interested, contact us at partner@buzzfeed.com.